An artist is seeking to finish his masterpiece, and your sanity is the required sacrifice. The premise Layers of Fear has echoes of Bioshock's Sander Cohen to it, but the 19th.century environments and colourful psychedelic twists promise something quite different. 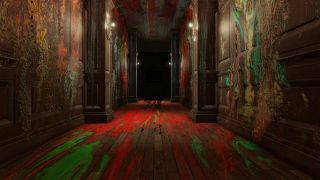 Inspired by "the masterpiece paintings from past centuries" Layers of Fear will apparently offer "deep insight into the madness that entwines a human being", which I think means it'll be quite scary and a bit weird, but hopefully in interesting ways that mess with the environment. Supposedly "each turn of the camera may change the look of your surroundings". It's out soon, on August 27, and is made by Bloober Team, who previously created another first person creep-'em-out called Scopophobia, named after an anxiety disorder "characterised by a morbid fear of being seen or stared at by others." Sounds promising. Here are the first screenshots of Layers Of Fear.